A luxury penthouse.Contemporary comforts. 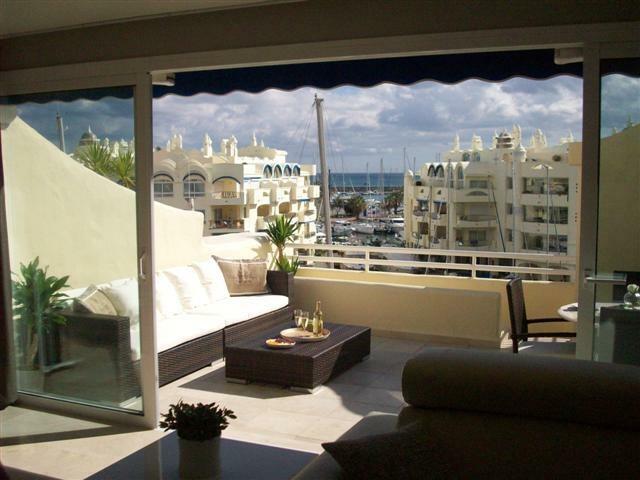 Large south facing terrace.Magnificent views (marina,sea). All rooms have daylight. Free wifi. Photos of every room. Korjattavaa: Master bedroomin suihku vuotaa, toisen wc:n viemärissä vetovaikeuksia. Joitakin lamppuja palanut. Kahvinkeitin hidas. Täysi lataus n. 50 min. Todella kaunis ja toimiva huoneisto keskeisellä sijainnilla. Huoneisto on sisustettu kauniisti, keittiö hyvin varustusteltu ja parveke upea. Voin lämpimästi suositella. The apartment was just like it´s it was told to be, modern with comfort furnitures, beds, etc. You really need only beach towels ad your private items - washing machine/dryer can make your luggage minimal! The terrace was great, local restaurants were with high quality and there were many other retaurants and shops nereby. We can recommend METRO restaurant. The supermarket was downstairs and LIDL (good prices) also very near. The apartment was quiet for sleeping. We were nicely wellcomed. Bathrooms were spacy, smaller one had some problems with water pipe in shower but not overwhelming ones. Only wish for us was better general lightning in the living room - that´s because of our hobbies = reading, knitting and wood carwing made often evenings... The apartment was lovely and we named it our PALACE. We celebrating my wife's 50 year birthday in Benalmadena and we have a party in this apartment. There was 19 person and we all fit to terrace and have a great, great party! Everything was just like pictures . Great restaurants, Opencor market, taxi station , everything is near. If we are coming back to Benalmadena, of course we will rent this apartement again..